It's been over a year since I joined Instagram, mostly to do the Sew Photo Hop which is a lot of fun and a great way to discover some new stitchers to follow. I am still kind of lukewarm on IG, mostly because I like words. Yes, words, sentences, explanations, details. And a single picture is not going to cut it for me. I read far too many blogs and then lots of other web content, plus listen to a lot of podcasts and that seems to get to my maximum level of consumption. 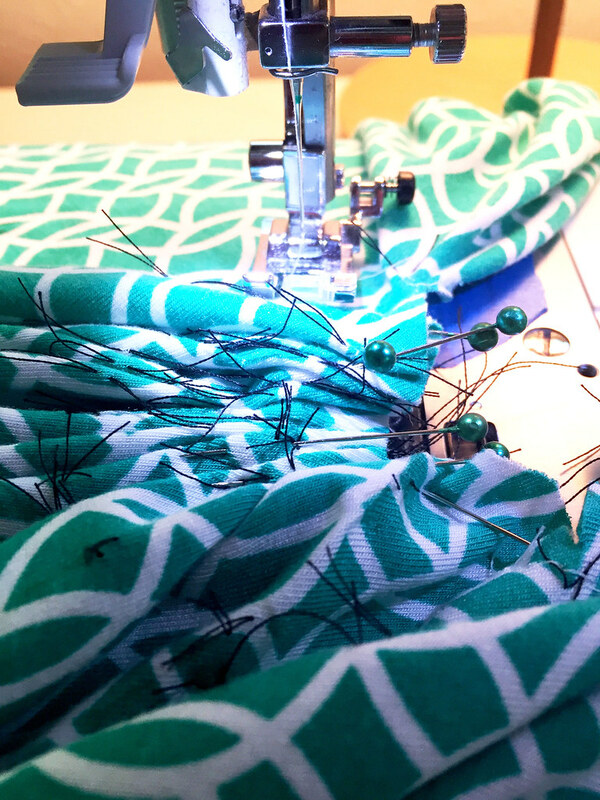 I fear doing any other internet based sewing stuff (like twitter, various forums etc) would just add to the screen time I already kind of regret. After all, that is not sewing time - or even life. Do you know what I mean? 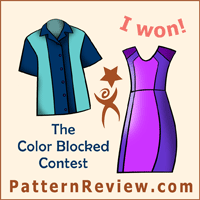 by the way - details on the pattern giveaway are at the bottom of the post if you want to skip ahead. Back to Instagram, it is fun to see what people on the other side of the globe (and the season) are doing, sewing-wise. 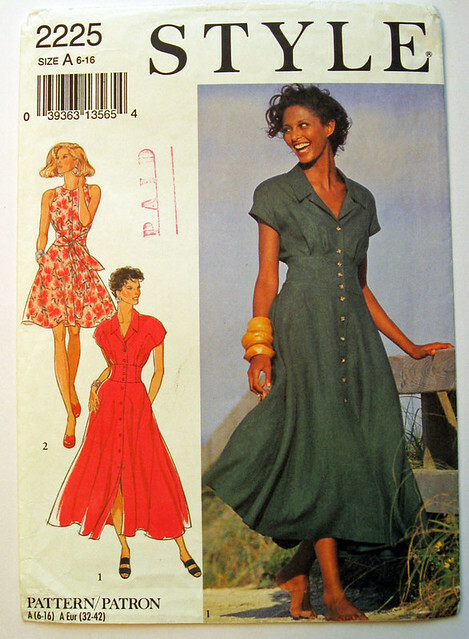 Recently Sew Busy Lizzy in Australia posted a vintage Style pattern that she bought and she wondered about that pattern company. Which sent me to look in my old pattern storage boxes as I used to use those Style patterns. Were they bought by another pattern company? Maybe Simplicity? 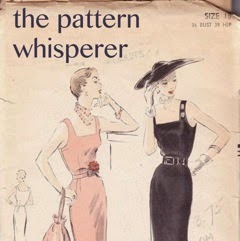 In any case they had some really nice patterns, I always thought they lived up to their name as very stylish. In the box I found a couple that I made many versions of, and one that I never used but now think I might try next spring. 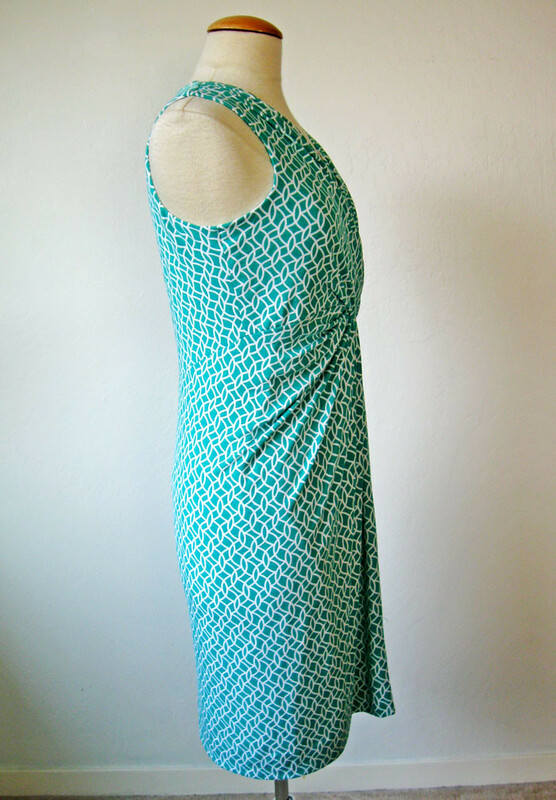 I'm sure I sewed this one at least once, probably as a sarong style dress to wear on vacation. See - my catchphrase applies - no new patterns. Recognize the current versions of this dress? Here's the one that I never sewed up. I kept this one out of the storage box, maybe next spring I will find some nice woven rayon and sew it up. The sleeveless version is my perfect combo of dress features. I both wanted to and didn't want to show you this one. Yes it is dated - look at the shoulders on that jacket. As I recall when I first started working and was maybe 22 ? 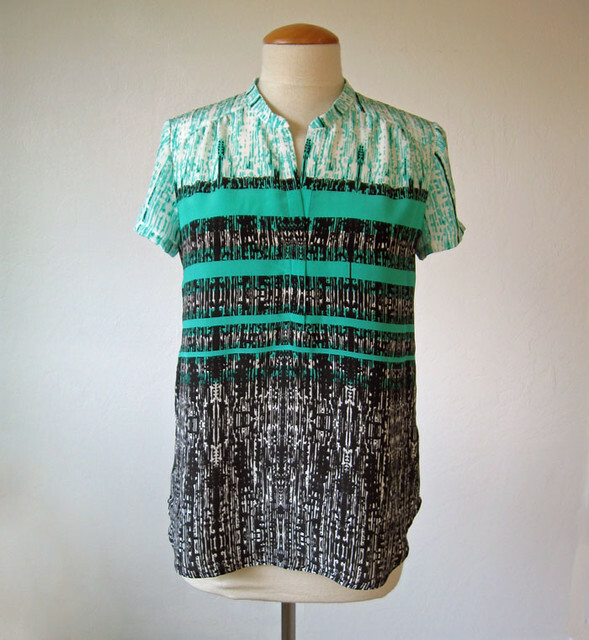 I sewed up this pattern in a really soft crinkly fabric that was an ikat print in shades of blue. 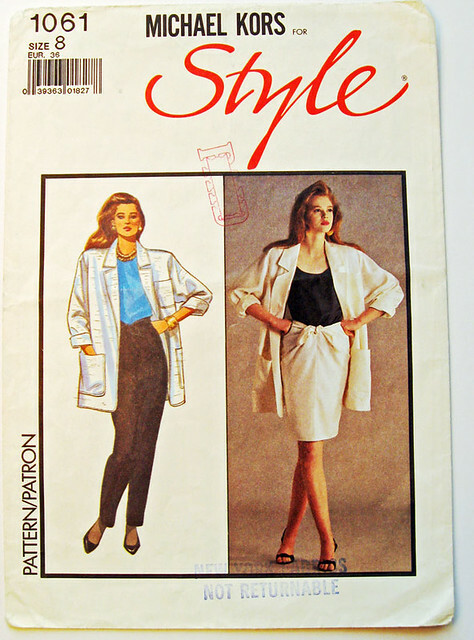 The unlined jacket was more like a big cardigan, albeit with shoulder pads (ha ha) but I think I had enough fabric to make a tank top so sometimes I wore the jacket and skirt with a white top and then also wore the skirt with the matching tank top for a dress look. But the thing to note is....Michael Kors ! Yes before he did patterns for Vogue this pattern company had him. I wonder what others I missed. And this skirt is so beautifully shaped, I made other versions as well. No fastenings, quick to make and very nice to wear. I found a few other goodies in my pattern storage box. My habits have never changed, if I bought a pattern and it resulted in a garment I liked then I kept it. If it was crummy or the garment turned out badly then I chucked it out. So these were keepers for a reason. 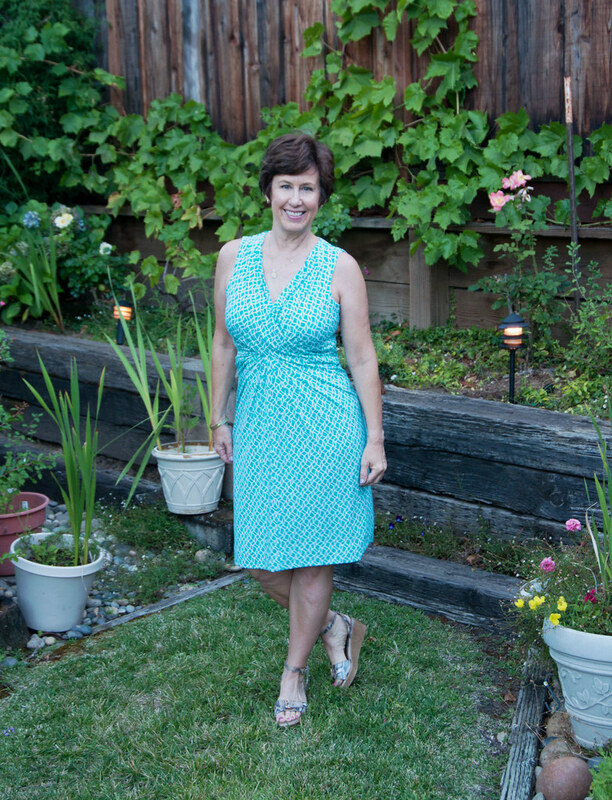 This Butterick dress I sewed up more than once, I think in a light blue linen for the V-neck version. Note the neckline of version C and E, it has a hint of curve and was so pretty. Made that in a printed rayon I think. Also I like skirts with pleats instead of darts. 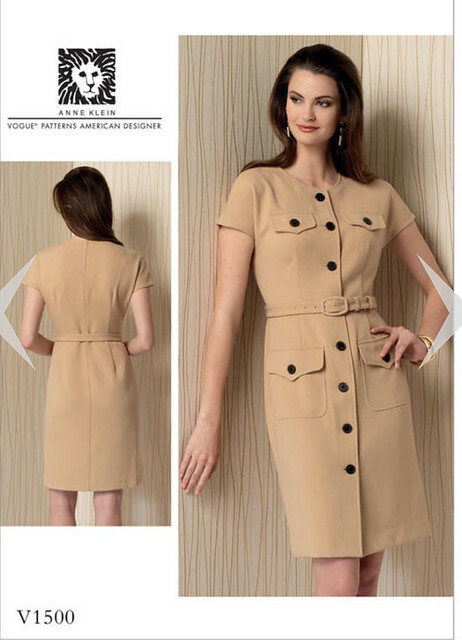 I have a lot of these Vogue designer patterns that I would classify as "business wear". Well they say career in red type right there on the pattern :) I know I made that blouse in the top image more than once, it was really nice to wear under a suit jacket. 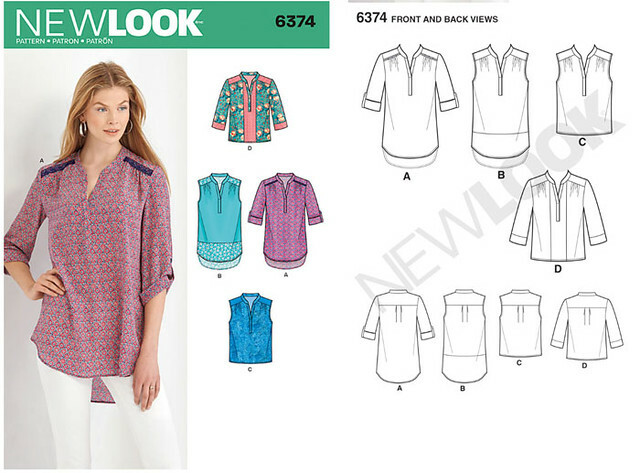 I have another of these patterns with 3 more blouse variations. 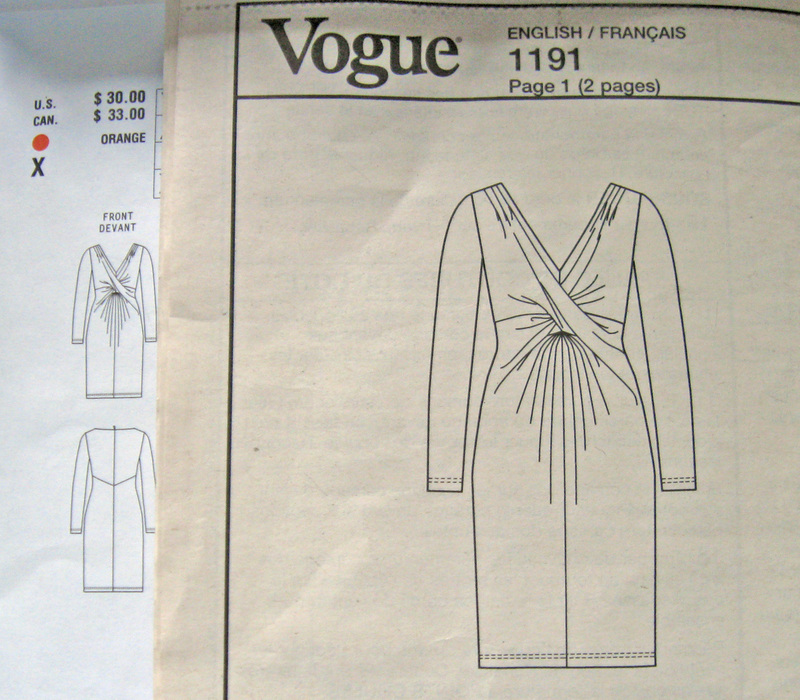 so quite a good value - you know I like Vogue patterns, especially when they give you lots of looks in one pattern envelope. Here's one I found that I haven't sewn, but it was also kept out of the storage box. 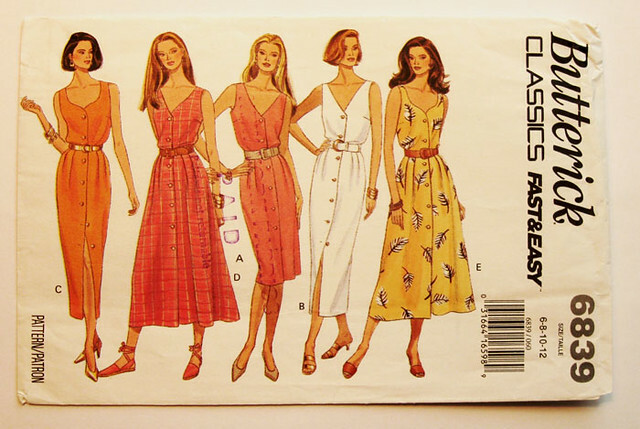 I think this was a style that I didn't wear and wasn't all that popular when I bought the pattern, but now seems really current. Cute top huh? I will have to try this one. And now for a giveaway. I found some patterns that were longing for a new home - to get out of the storage box and into the hands of someone who might use them. So here are two patterns that I will do a drawing for and mail out to you. The Catch: please tell me your Time Saving Sewing Tip. I'm writing a post for Craftsy so you might see it there, but if you are willing to share some timesaving tip, something that helps you to use your sewing time wisely, or cut down how long it takes to make something then I will be really grateful. Also tell me which pattern you would like to be in the drawing for. You can say both if they both interest you! 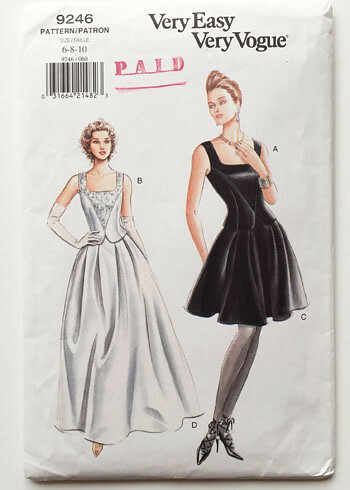 Pattern 1: Vogue 9246 corset type top and ballgown skirt. I think I bought this to use to make a formal dress but ended up designing something else - so this one is unused. Note the pattern size is 6-8-10. 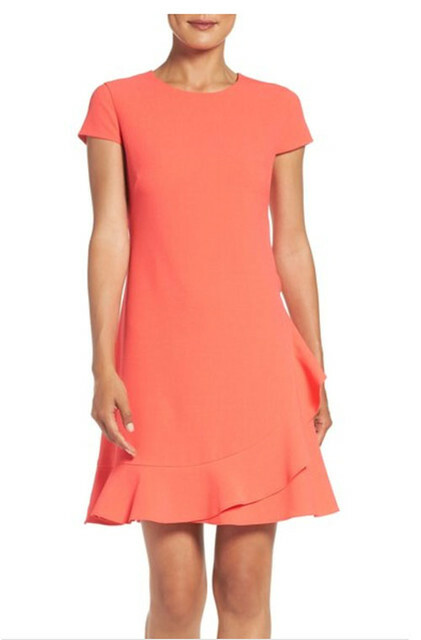 I love the square neckline on the top. 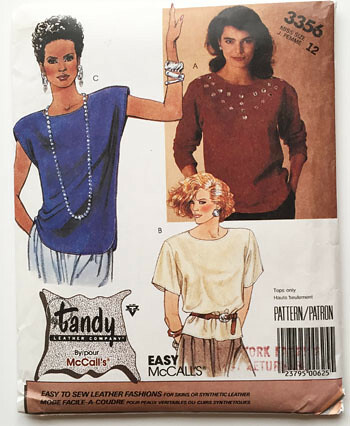 Pattern 2: McCalls top, designed for leather or suede. Size 12. Don't laugh - despite the shoulders this pattern is a wealth of information. I seem to have more than one copy of this pattern so I must have liked it. The other copy was used and I made at least 3 suede t-shirts which I thought were the epitome of casual+luxury. Also I made a suit - all of these items are now languishing in a closet somewhere and candidates for being cut up and refashioned into something else. Lest you scoff at this funny looking pattern - here is a peek at the instruction sheet. 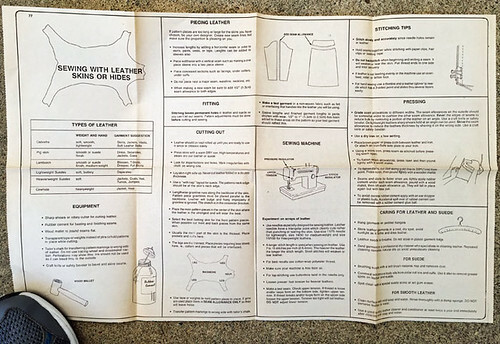 It includes a complete lesson on working with leather. How to determine how much to buy, piecing, machine tips and techniques, seam finishes etc. This is in addition to the regular pattern instruction sheet. Rather clever and using this the info all my stuff turned out really well. Leather is really easy to sew, the tricky part is the cutting layout. So that's the pattern scoop. I hope someone is interested in these patterns, as I said they need to get out into the world and be sewn up! Remember to tell me your timesaving sewing tip, and I look forward to seeing the Sew Photo Hop in September, is it happening? I hope so. 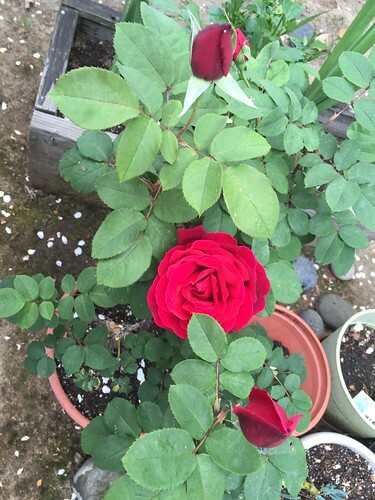 today's garden photo, this rose bush was not thriving so I pulled it out. Stuck it in the no man's land which is behind the garden shed. And it kept growing. Thus I took pity on it and planted it in a pot. I guess it just didn't like it's original spot because the blooms are beautiful. Now I just have to find a better permanent home for it. This year I have resolved to sew some different shapes and types of garments, with mixed success. I suppose the reason we (at least I) stick to the same things is that is what is comfortable, familiar, or even perceived to be flattering. 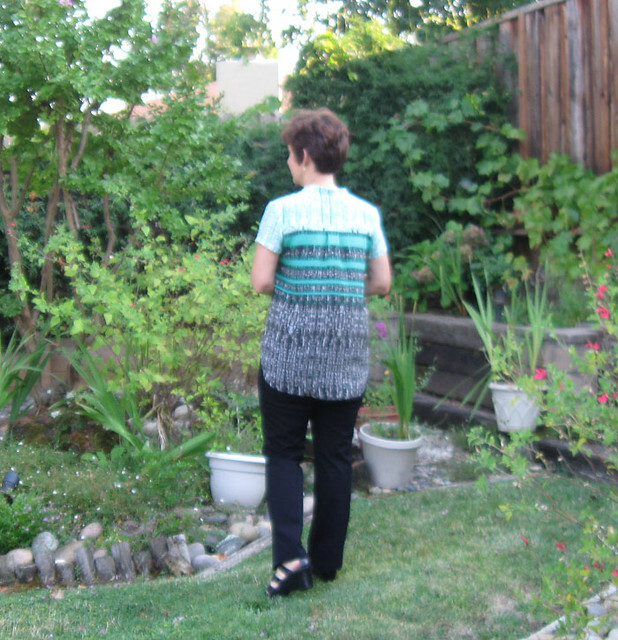 Previously I have not sewn many woven tops - I do have a number of button front shirts but other than that all my tops are knits. However now that I took the plunge with this great result I predict more variations on this theme in the future. So the latest foray into silk tops is this. Which I absolutely love. And labored over - due to the unusual fabric. Although it might not appear unusual as a finished top. Here's a look on the dress form. This fabric is a silk, crepe de chine, I guess. Which I got in the upstairs discount room at Stone Mountain. They have so many treasures to be discovered there, I rarely come home without something I find in that room. Which has even more fabric now as they have discontinued classes - so they have more space for fabric. What came first, the new pattern or the new fabric? Actually I bought this fabric maybe 2 months ago? and keep thinking about what to do with it. It definitely presented a challenge because it is actually a border print, or I think you might describe it as an asymmetrical stripe panel print. Anyway I did remember to take a photo of the fabric before I cut out the top. 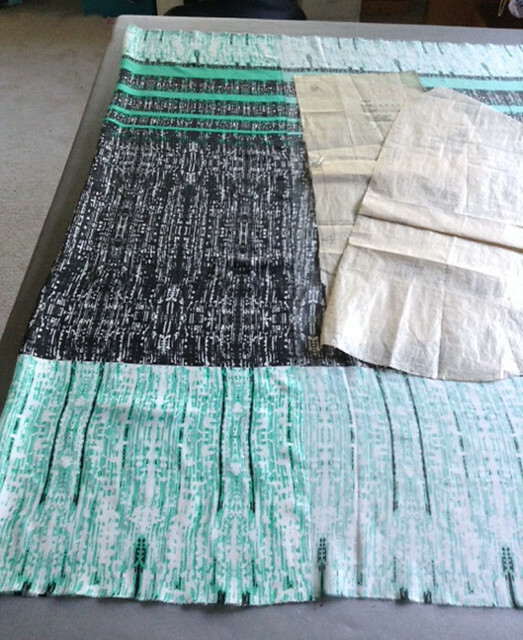 It was about 42 inches wide with the lighter section separating the black/green stripe sections. I think the yardage they had on the bolt was not cut along the panel so they cut me this portion which gave me some extra of the light portion you see at the top. The main top pattern pieces are there on the table so you can see how I used the stripe and dark/light section. The uninspiring pattern envelope. My opinion, adding those bits of blue lace on the one in the photo takes it straight to frump town although the color is not my fav plus those elbow length rolled up sleeves rarely look good on anyone. So why did I buy this pattern? 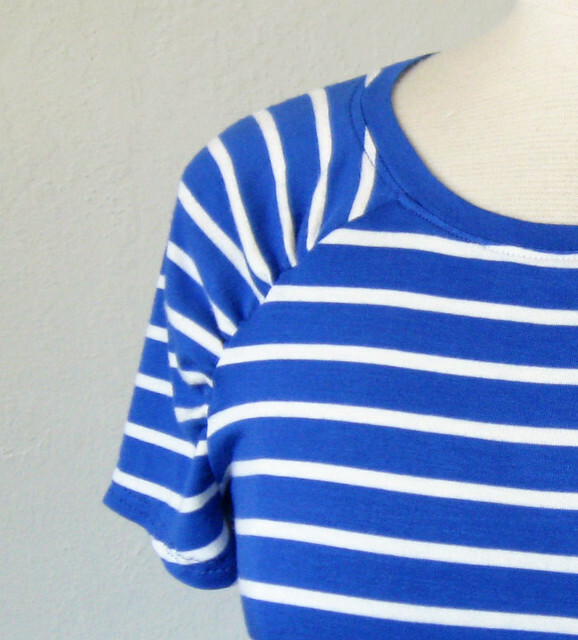 Well after my success with my previous New Look top (another version here) I noticed this one which has a nice small placket with a slight angle to open up the neckline, plus it has the shoulder gathers instead of bust darts, so good for stripes. 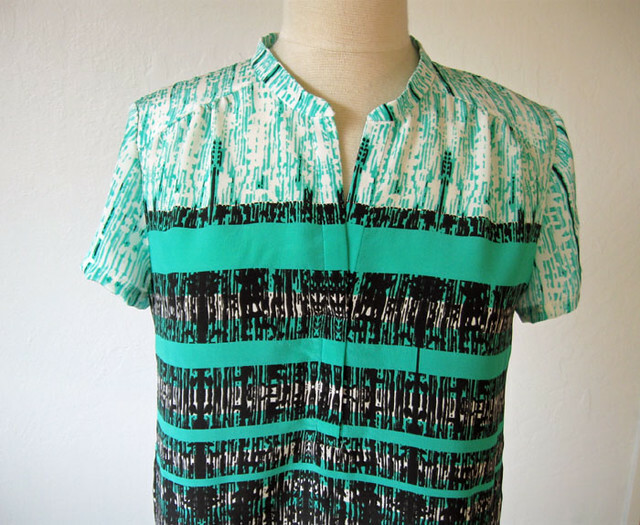 Also the shirttail hem although basically you can add that to any pattern. I think the collar is a bit on the skimpy side and for a winter version I might add some width to it. OK for a lightweight top but it is really neither here nor there, not a binding and not really a collar. Odd. 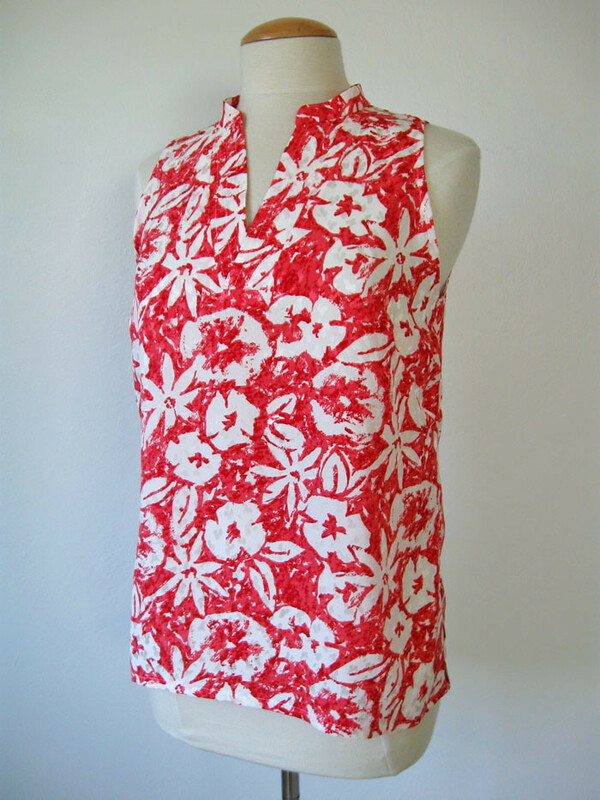 In fact I just made another version of this top where I opened up the neckline and made a round band which sounds complicated but is not really - and I will try to show in another post. 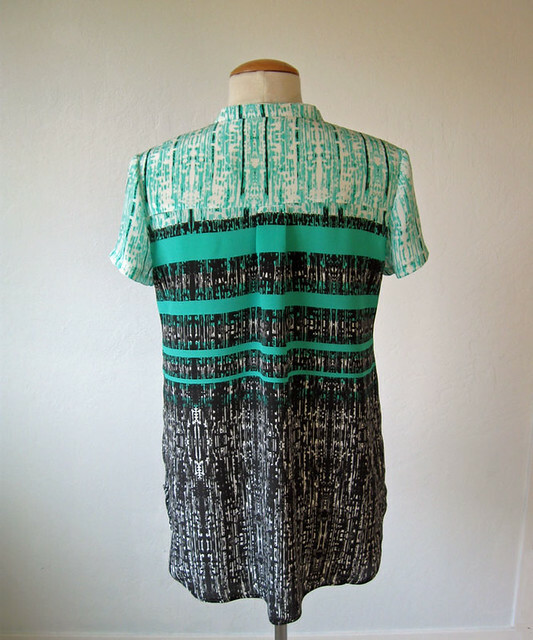 Because pattern reuse - I am all about that once I get a good one. So how did I use the various bits of the fabric? First I cut out the body pieces matching the stripes for the front and back. Then I cut out the front shoulder pieces and the back yoke from the light portion of the fabric, also the collar from little scraps remaining, taking care to reserve as much of the light portion for the sleeves. Figuring I could also cut out the placket pieces from the remaining fabric. I thought about making the placket from the mostly black section although I wasn't sure that would look quite right. In any case once I was ready to cut the placket all that remained was the stripe section so DRAT! I had to cut it out very exactly to match the stripe across the placket and front. Which was a little bit of a pain but now I am so satisfied with how it turned out. Woo Hoo! Good thing I had all my recent placket practice, haha. A little construction view for those of you who like to see the insides. I used the Pro-Sheer Elegance Couture interfacing for the placket pieces and the collar as well. 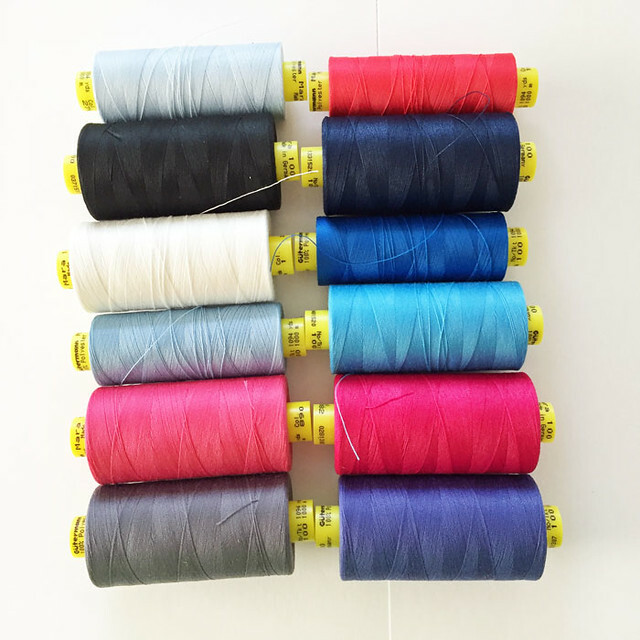 They (Fashion Sewing Supply) just have the best interfacings and if I could only have one type on some imaginary desert island of sewing I would take all the Pro-Sheer Elegances in every weight and color. Which might be cheating as that is picking more than one but it is my self-imagined desert island of sewing. With unlimited deliveries of snacks from Trader Joe's and wi-fi for my podcast sewing accompaniment. Sorry about the focus on this one - all the back views are slightly blurry but you get the idea. The back is about 4 inches longer than the front. Like I said, slightly new silhouette for me and in this fabric I think it works well. Quite breezy when these pics were taken, but you get the idea of how floaty and lovely this fabric feels to wear. So another try at a new shape and I'm quite happy I did. I can see using this pattern for other types of tops, a long sleeve for sure for winter. And maybe even a drawstring waist. I'll have to see what strikes my fabric fancy in the next few months. Until then it is still summer here !!!! I hope. Although you can notice the evenings getting darker just that little bit earlier each week - boo I don't like that. By the way, a little plug for Stone Mountain Fabrics - I saw they had this fabric in the store again, both in this color and in red/navy. 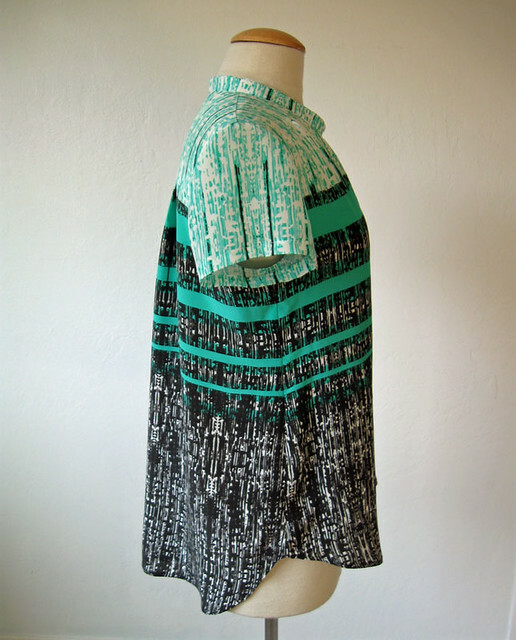 I seriously love that fabric, it is an RPL knit I guess but the weight and colors are exceptional. Also I have bought two color ways of this fabric which is super soft and lovely. 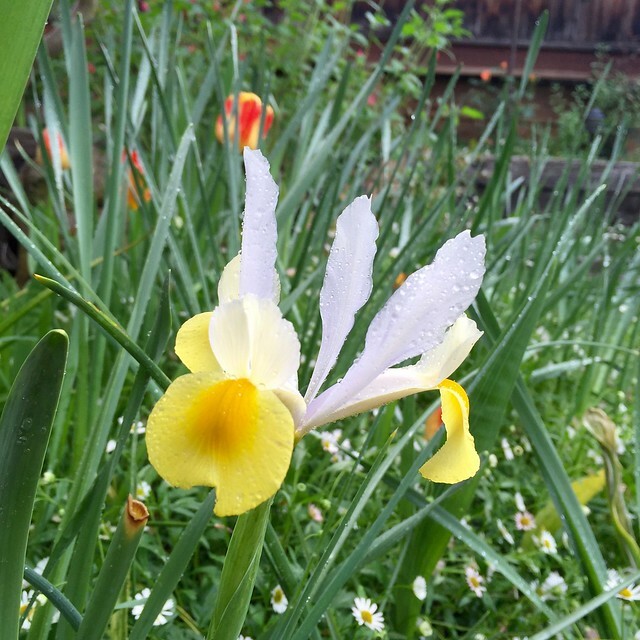 today's garden photo - I found this on my camera roll from back in April, a yellow iris covered in raindrops. Sometimes these iPhone photos amaze me. Plenty of scribbles in my notebook so it is time for another Random Threads post. I can't believe August is more than half finished, you know I love summer and put autumn at the bottom of my list of preferred seasons. Chilly weather, falling leaves, days getting shorter. Not my thing at all. And the raptures over fall sewing. I don't get it. Summer fabrics forever! But of course if we were all alike it would be boring and so I will check out your fall sewing and possibly be inspired. But don't count on it. Onward to my random thoughts. Circular ruffles - remember this post I did a few weeks ago? 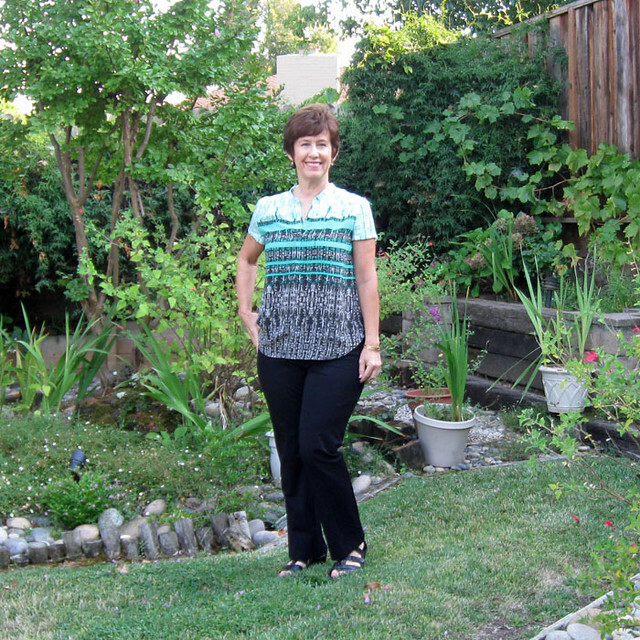 Where I made a dress with a circular/flounce ruffle because I was writing a post for Craftsy. And then promptly removed said ruffle before even wearing it. The other day I was taking my periodic wander through Nordstroms in order to snoop all the designer stuff (be still my beating heart - Armani Collezioni your wools are heavenly, Lanvin and Marni caught my on this day as well). In both the designer departments and the more down to earth dress section I noticed a lot of circular ruffles. Both on hems and as a detail elsewhere. Here's one that I saw. Pretty how the ruffle curves up the side. Are you watching the Olympics? I love them, every time they come around I am just a sucker for the whole thing. Plus it is such a nice diversion from politics - which we desperately need for a while. Anyway - I was thinking about sports the other day and realized I have never played a team sport despite doing a lot of sports. The closest I came was playing on the tennis team but tennis is not really a team sport in that you are playing individual matches. So tennis, skiing, golf, diving, even sailboarding a bit but no team sports. And yet I love to watch almost any Olympic sport. Well maybe I can skip the table tennis and badminton. Plus I am fascinated by the women track athletes - they look so beautiful. Do you watch only the sports you are interested in? or could not care less about the Olympics? Even all the various team uniforms and competition apparel - everything is fashion now and quite interesting to me. Article in the NY Times about McCall's pattern company: here is the link, I am going to guess that a lot of you have read it by now. It was interesting to read although short on business details. I would love to have heard about how many patterns they sell annually, what are their best selling patterns etc. No secret that I am a big fan of Vogue patterns, particularly the designer patterns which have details from high fashion that you can't find elsewhere. These days I am not quite as good a customer as I was previously, having so many patterns in my file means I can usually find something that is pretty much the same as in their new offerings. But a pattern with multiple views and versions is what Vogue et. al do better than anyone. 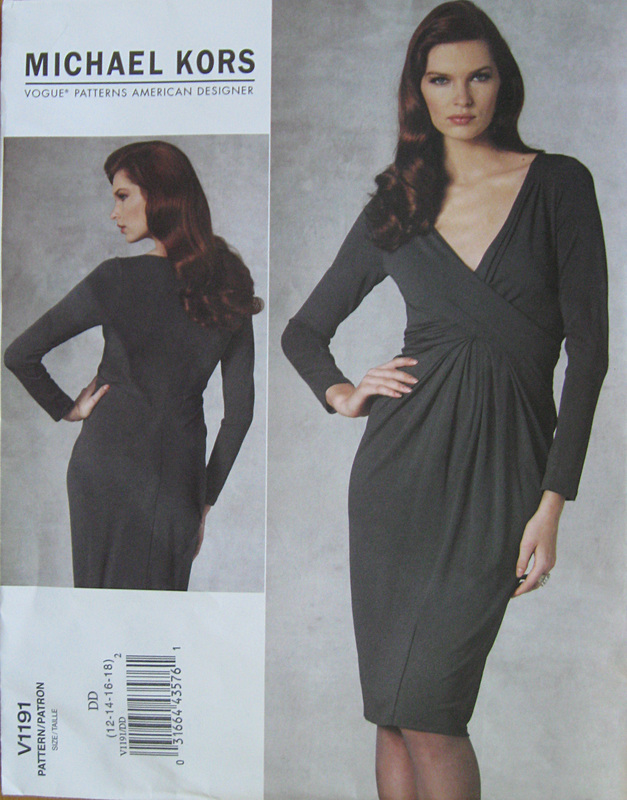 My latest Vogue pattern purchase was this one, V1500 which I thought had possibilities as a dress and also to convert into a top. So only one item here but I can envision it as other items as well. Labels in clothes: I think I have mentioned this before in a previous random threads. This week I took a bunch of donations to the charity shop and was looking through my cast offs before bagging them up. And realized that any store-bought clothes I have all have the labels and tags removed. I just can't stand to have any tags or labels, they always seem to scratch. So I remove them all - which means there is no size label. And then my handmade stuff, also no size indication. So I asked the woman at the shop what they do and her reply was "We put 'em out and they have to try 'em on". Which made me feel OK about donating to that charity. At least my handmade treasures might make their way to someone who appreciates them. Hope so! But labels - I don't get it. To me that is a good thing about sewing - I don't have to have some stiff and scratchy label. Thread colors: How many colors do you use? A sewing student remarked the other day that I didn't seem to have a lot of thread. Here is a pic of the colors that I keep in the drawer next to my sewing machine. These are the colors that I use for just about everything. I rarely buy thread to match a fabric - other than topstitching it doesn't show so who cares? White as often as possible - then I use navy on black and black when sewing navy. The black/navy thing is to save my eyes - which have been toting super thick glasses since the 4th grade. Thank goodness for contact lenses :) But back to thread. Sure, my sewing color palette is heavy on the blues but I find these threads enough. I do have a rack of other colors, like greens, beige/tan/brown/jeans thread, a few various reds and burgundy colors. Plus a bunch of singular colors like yellow, bright orange or a specific gray. Generally though I get by with these. And the two most useful of the colors are the two at the bottom. Grey is magic - when in doubt try grey. Also the purple one on the bottom right. It looks more violet here than it is in real life where is can become a light blue, pale violet, or even grey depending on fabric. Surprisingly useful. 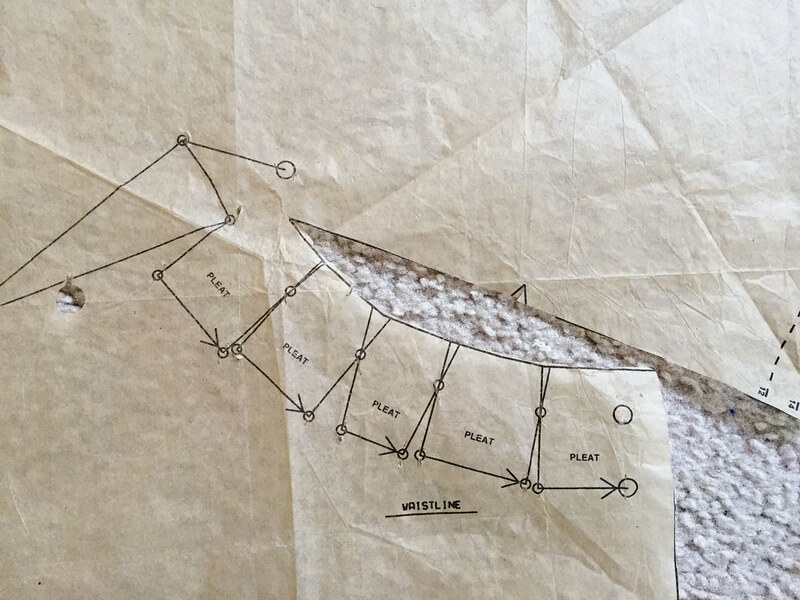 Show me the garment: is anyone else sometimes frustrated when you are reading a blog post, or pattern review, or looking at an instagram pic of an item that someone has sewn and due to their pose you can't really see the details? Or maybe it is just me. The one that bugs me is having all photos with both hands on hips. Sure I do that - I think it is to avoid standing there like a stick figure, it feels natural and looks nice. But with both arms up then the armhole is distorted and I can't see how the pattern really looks. If I'm talking about a pattern I try - not always successfully - to show the pattern and how it fits or what I did to adjust the fit. Even some pattern companies do this - which they think might disguises the problematic areas but I think just exacerbates them (Colette - in my experience helping others their sleeve/armhole design is just weird and likely to be trouble). So fellow stitchers - show me your garment and I will try to do the same. Some are really diligent about showing the garment; front, back, sides plus details. Those of you, I salute you! Fancy packaging - does it make you like something more? Recently I have read a few posts where someone wrote about an item, I think one was a sewing pattern and the other was something else, where they were in raptures over the fancy packaging and felt that it made the experience better. That fascinates me as I find if something is packaged lavishly it actually annoys me - it seems wasteful and like I am paying for that which adds no value to the actual thing. Packaging is meant to be thrown away so it seems odd to put too much into it. However I have ordered things on Etsy where the seller packaged items in what was obviously reused material and yet it was done with a bit of charm and whimsy. Or received gifts from friends from Japan that were beautifully yet minimally wrapped (they might be the masters of this). Anyway - clinging to my old habits - give me a nice tissue paper sewing pattern in a small white envelope and I am a happy customer. Stripes! a festival of stripes! Stripe-mania! Stripe-A-Palooza! ok that is a tortured way of saying I have just completed 3 striped items in a row and I anticipate more. What is happening? I almost never sewing anything striped until a few years ago. Odd, I admit. But now I really like them. If you look at my instagram you will see a striped item that I posted which I am growing to like a bit more but was unsure since it is black, or mostly black and I hardly ever wear black. Because it is boring! OK there I said it, boring. Not fun. Dull. Anyway - this one might be redeemed. Full blog post on this one soon. And a sneak peek of something that is more in my color wheelhouse. This one is pattern love - also soon to be blogged. Confirmation that this dress has become something of a summer uniform (despite my sister saying yesterday "Did you make that dress?" Me "yes" Her "oh" Me "why, what do you think?" Her "it's ok, kind of looks like a housedress" Me "well I like it" ) Sisters.....you know how that goes. Love them and the conversation never changes since we were old enough to talk, right? Only 92˚F on the thermometer - cool and balmy for an August day. But not really blue skies - the fires are taking their toll on N. California and I feel so bad for everyone in their path. Take care everyone and stay out of mother nature's way. today's garden photo - here is a trailing geranium that was in the shade and not really doing anything. 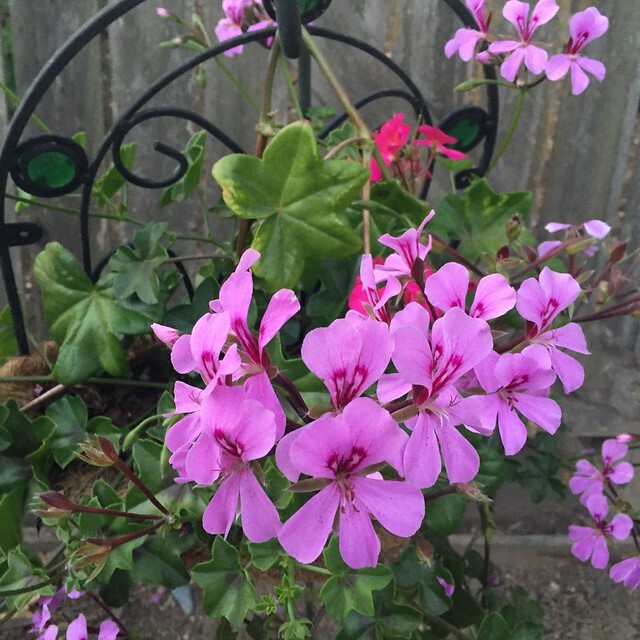 I moved it into one of those hanging baskets in the sunshine and wow, so many blooms. I see the hummingbirds in the evening all over this one. 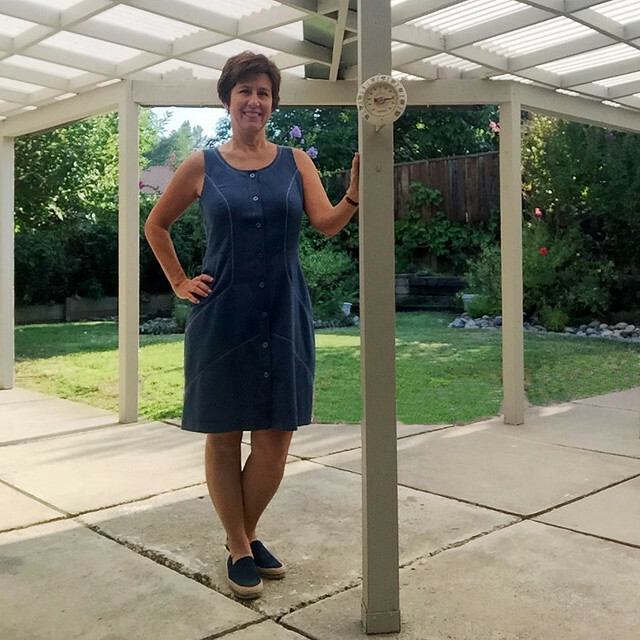 The sewing resolution for this summer was to stay away from the dresses - but that is a very difficult resolution to keep! Particularly since this pattern has always been calling out to me to sew it up again since its first version, back in 2011. Really? It has been that long? Of course I still have not sewn it up as pictured on the pattern envelope - with the long sleeves. Earlier this spring at a Bay Area Sewist's meet up I chose this fabric. A few times a year the group does a swap day, either fabrics or patterns and they are a fun way to get rid of stuff you don't want (and probably bring home stuff you don't need) In any case, everything is put out on the tables grouped by fabric type - we stroll around and check out what is there and then there are a few rounds of picking. 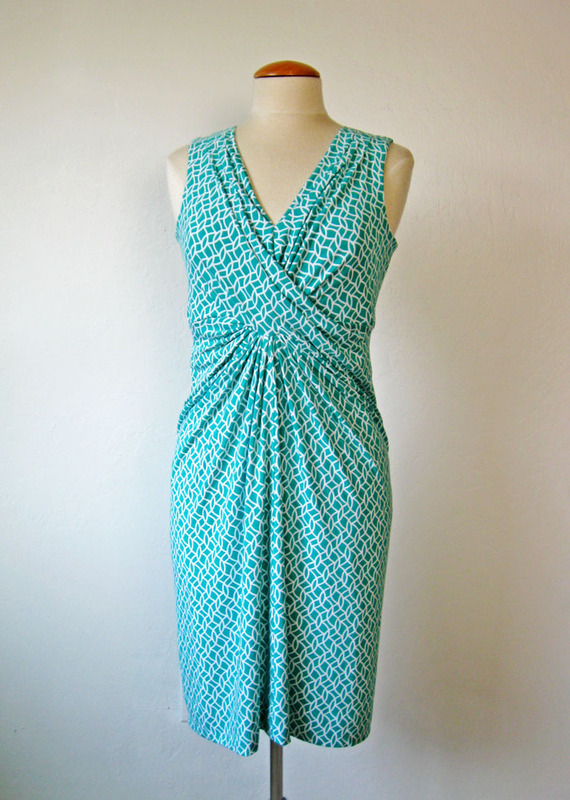 I spied this green knit print right away and it was 2 full yards so plenty to make a dress. I have picked up some other useful fabrics there as well, and at the very least it is a good way to get some otherwise unloved items that can be used for pattern testing etc. 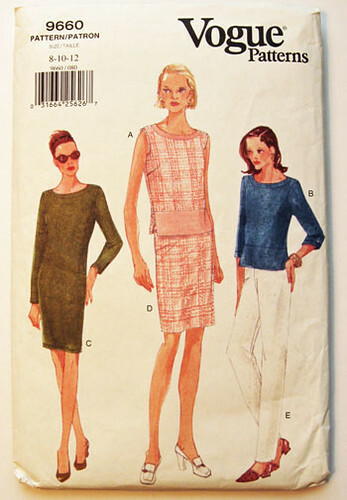 The pattern swaps are fun too, I have a Vogue Donn Karan pattern that Laura Mae insisted I take as she said "it looks great on everyone" although it is still in my wishful thinking pile. Just in case anyone is ever wondering - that dress form is not my measurements, it is near enough in the bust, but the waist and hips are smaller. I bought it at a garage sale and it is great for everything but exact fitting. Having a custom dress from with length measurements as well as the circumferences would be so nice but I am not about to invest in one now when this one is good enough :) plus it has wheels on the base so quite handy. Pattern, Pattern, what's the pattern? 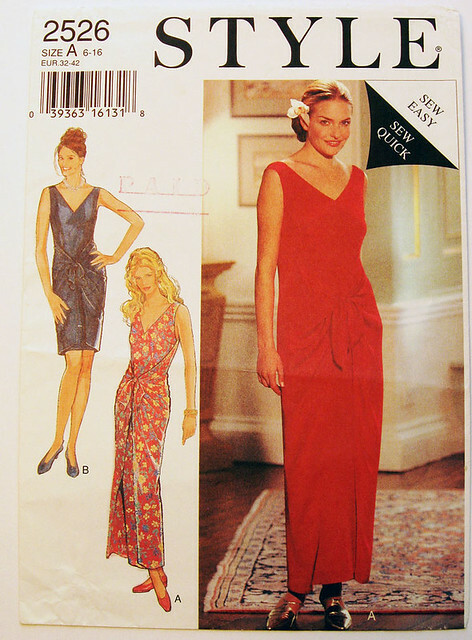 It is this Vogue Pattern 1191, a Michael Kors design. He has long since stopped doing patterns for Vogue but the ones he did are outstanding. 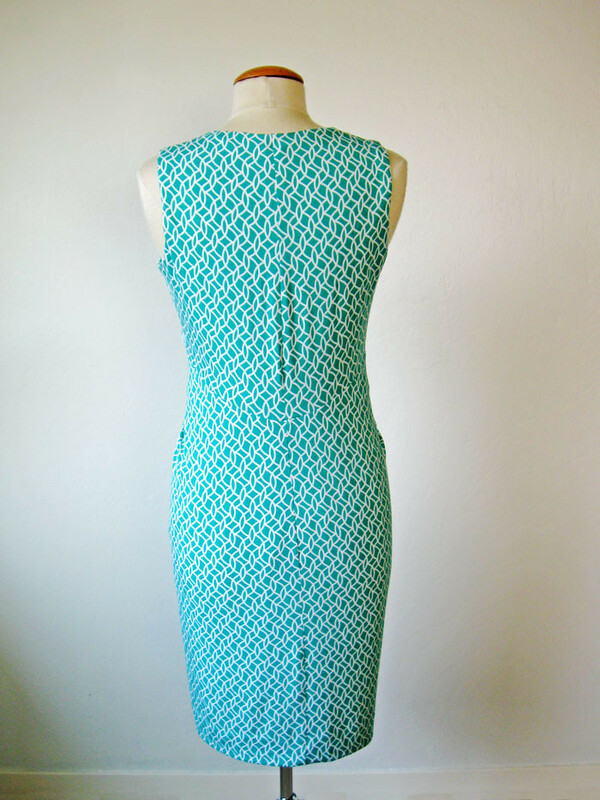 The other one I made is the Vogue 1117, sewn in my first year of blogging. That became my go-to fall/winter party dress for awhile. Do you get to a point where you know all your family/friends have seen a particular item and it is time to move on? This is a small dilemma of sewing, you want to wear the stuff you made and absolutely love - but then there are other newer things that should get worn as well. Ok not the biggest problem in the world, just an observation. This dress has a lot of quirks -sewing wise. Here is the link to my first version of this pattern. Because yeah, this is a bit confusing and there are a zillion dots, pleats, tiny darts, twists etc to keep track of. And you know I am a mad tailor tacker so it looks like cat's whiskers or something once I get them all done. Also I keep the pattern piece tacked up on my bulletin board while sewing, so I can see which way the stupid little pleats get folded etc. The result of all that marking, pleating and twisting is this. Now a couple of warnings for this pattern. It is very low cut - as many of the Vogue designer dresses are. Fine for the runway I suppose but not for real life - at least not in my comfort zone. Plus I am shorter by 2 inches than the pattern is designed for - so keep that in mind when things don't hit you at the right spot - that is often the culprit. Those "shorten or lengthen here" lines are there for a reason! although not on this pattern. This is one of those "no provision for adjustment" patterns, other than the multi-size that is in the envelope. I made a size 12 on top - moving to the largest size at the hip, and then shortened at the shoulders by about 1/2 inch. But on top of that I sewed the center front seam longer by 1.5 inches which serves to raise up the center V neckline. I saw that adjustment in a review on Pattern Review when I made it the first time and it was really good advice. Also after you do the twist and have the whole front completed I found it needed some hand stitching on one side to have the fabric cover up the bunch of pleats. Wasn't much but it makes the front much neater and it stays in place and drapes properly. I also raised the armholes by around 3/4" since it is designed for sleeves. For those of you who like to see the construction: A lot of pins and pleating. And the insides: this pattern has a self-lined front - all one piece, and then the back has a lining. 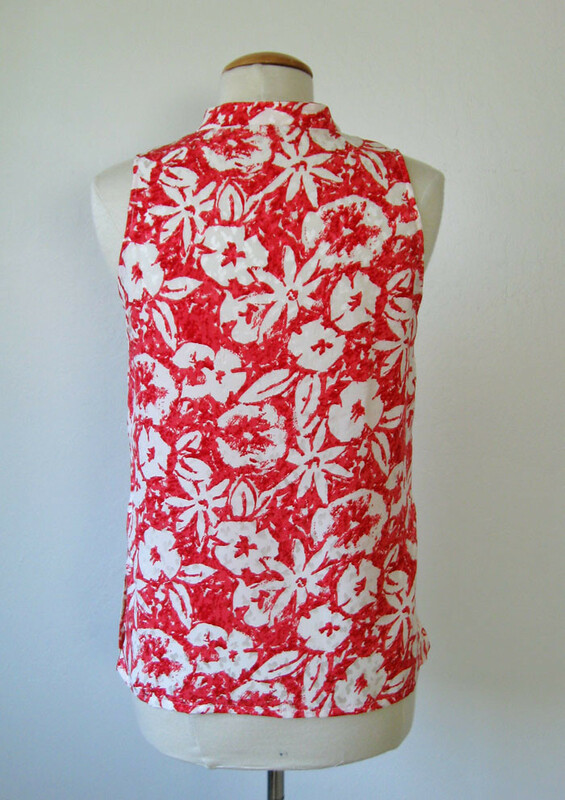 For this I used the polyester knit lining fabric as I do in most knit dresses, it is called Jet Set and available at Joanns. In this older Random Threads post there is more info on this fabric. The back on this dress is plain, the front/back skirt is all one piece and it seams together down the center back. The sun was going down as we took these pictures, you can see the garden lights are on behind me. I really like color of this fabric - it lands in my jewel tone color preference. Plus it feels like a nightie, super soft and comfy. Whew summer is fading fast, the garden has moved from blooming to crispy and slightly bedraggled. Kind of how we feel when the temps soar over 100˚F for a few days in a row. Which we had about a week ago. 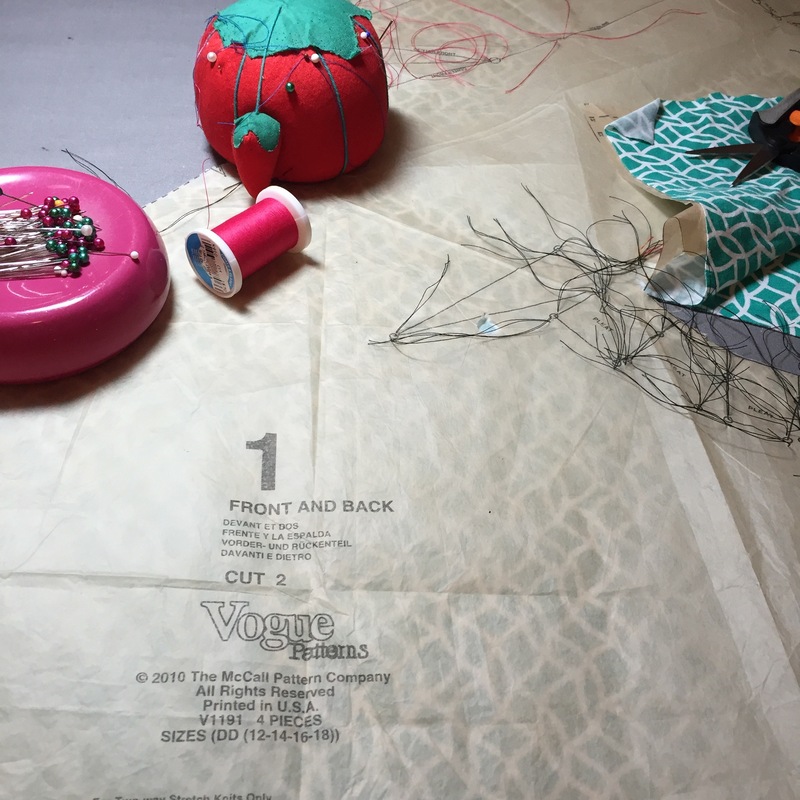 No time to think about fall sewing when that happens! today's garden photo, I forget the name of this plant which I bought at the local junior college horticultural department sale about 2 years ago. 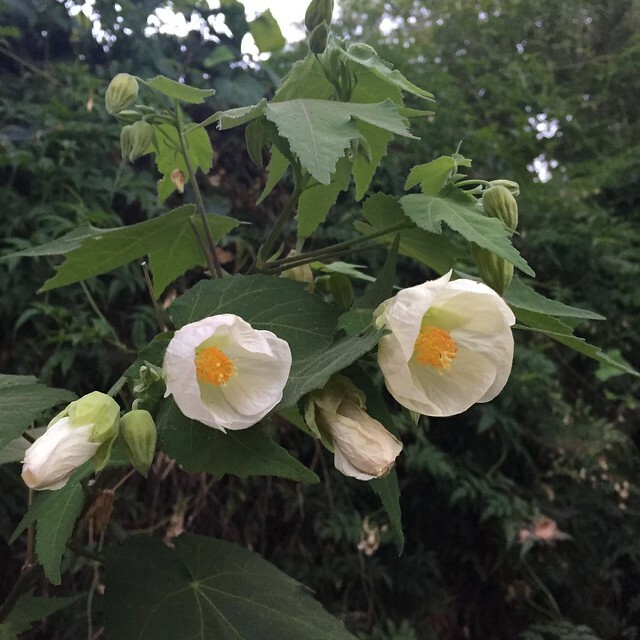 It was looking kind of wimpy - I planted it in some shade but it has reached out branches into the sunshine and now doing quite well. I like the papery white flowers - the look like lanterns before they open up. Based on the amount of times I have worn this top already this summer I can say this might be my favorite sewing project of 2016. The combo of floaty silk top and cheerful print make it just right for any moment. Yes, big smile for a simple silk top. 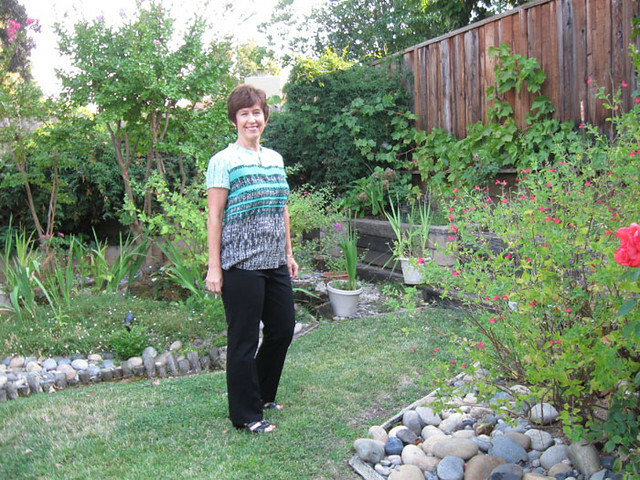 You might recognize the fabric, when I made this silk blouse back in January I had just about 7/8 of a yard remaining which was just enough to make a top. And what a difference the season makes, that blouse photo was taken on a gloomy cloudy day. Although now we are entering into the crisp brown phase of our California summer so some rainclouds would actually be nice. While the year is only half finished this pattern has become my go-to top pattern so expect a steady stream of variations. There is something about the simple placket that makes it just right in terms of proportion and usefulness on a variety of fabrics. Not sure if it shows up in the photo but I did do the stitching on the placket, which adds a bit of visual interest close up. For reference here is the pattern envelope. Ignoring that kind of ugly and very basic version that the model is wearing, I have only sewn the A-B-C versions, in fact only the sleeveless. But I expect the long sleeve version A will appear this winter. I think this pattern is a few years old and probably out of print. 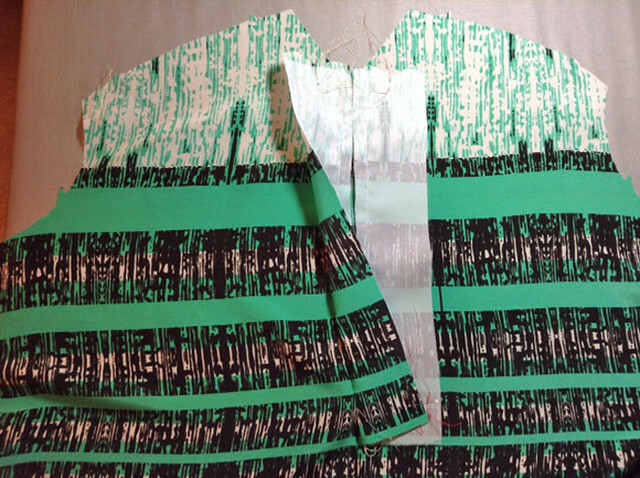 front and back view on the dress form. This is the same top as I made a couple of weeks ago for my friend Alice, in a royal blue eyelet. That version is a stunner. In fact I just bought some similar eyelet fabric for myself at Stone Mountain, in a pink-coral color so I need to sew that up pronto for summer wear as well. Pattern modification: not really anything on this, I am using the basic size 12 pattern and didn't have to adjust anything. The one design change is to cut in the armholes - which someone asked about recently. Both the "why" and the "how much". Here is the back view on me, to answer the why. 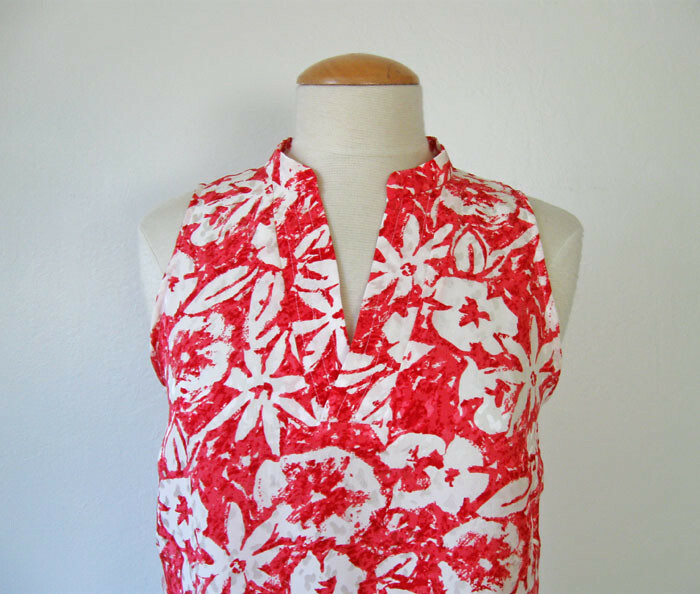 If I sew the pattern as designed, which uses the same pattern piece for the sleeveless and sleeved version, then the end of the shoulder point is quite far out on my shoulder. I just don't think that is a flattering look - particularly if you are a small or narrow shouldered person. And I have mentioned before that I think tops/dresses with no adjustment for the sleeveless version just look clunky to my eye, the proportions are off. 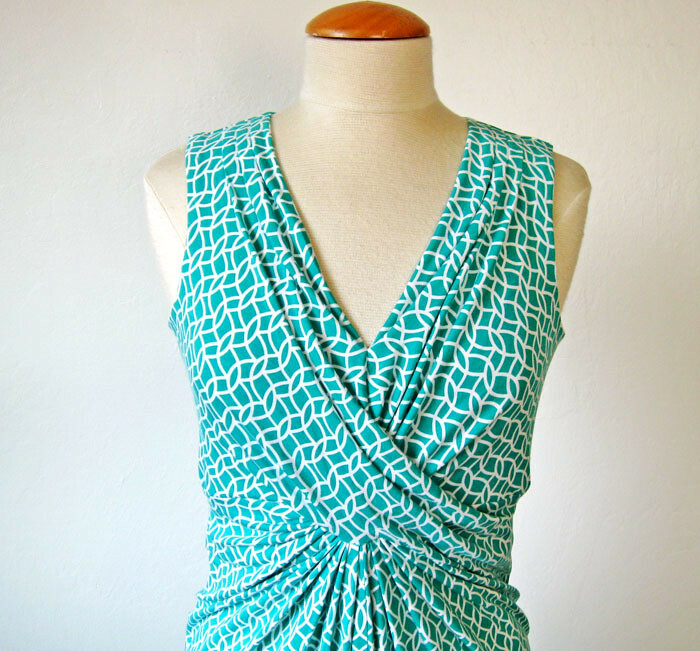 I typically raise the bottom of the armhole and then move in the outer shoulder point. Anyway - this is basically my summer uniform, my go-to, my fallback, whatever you want to call it. 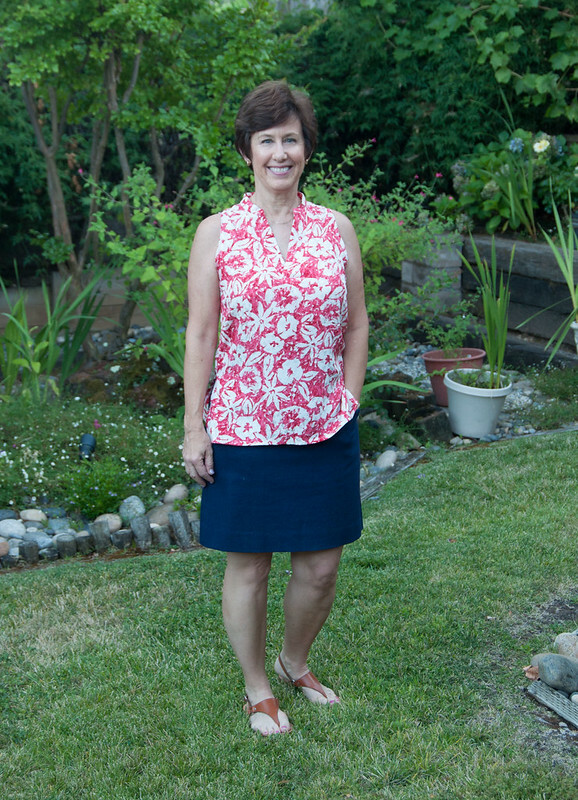 Knit or silk sleeveless top and a denim skirt with pockets. 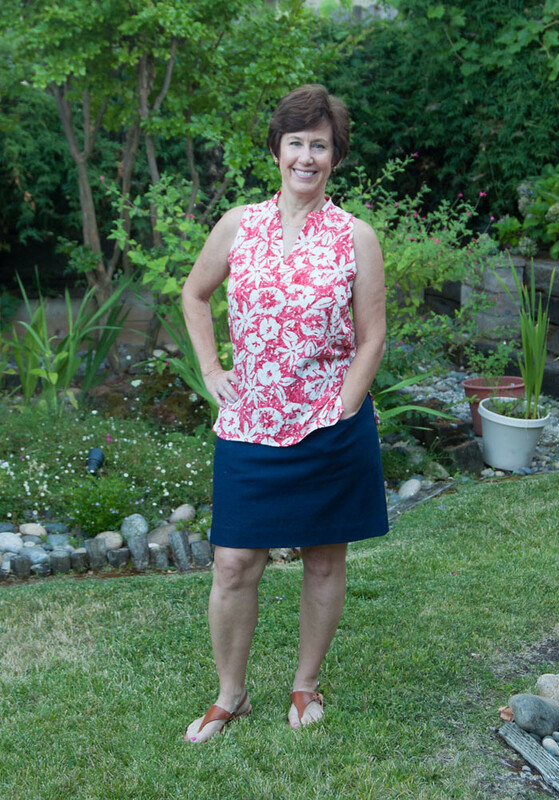 Skirt pictured is my trusty Vogue 1247 - the only pattern number I know by heart. Which I have made 5 times I think, surely with more to come. Oh yeah, big smile for comfy summer clothes and wearing sandals all the time! Bonus note - I got this silk fabric at a ASG stash sale - so investment is about $ 6. For two shirts. Score! Does the minimal investment increase my satisfaction? Always. What can I say, I love a bargain fabric find. Up next, more tops, plus a pattern repeat Vogue Designer dress which snuck into my sewing production and proved again to be a winner. Plus some unselfish sewing and a Random Threads post in the works. today's garden photo, Dahlias. 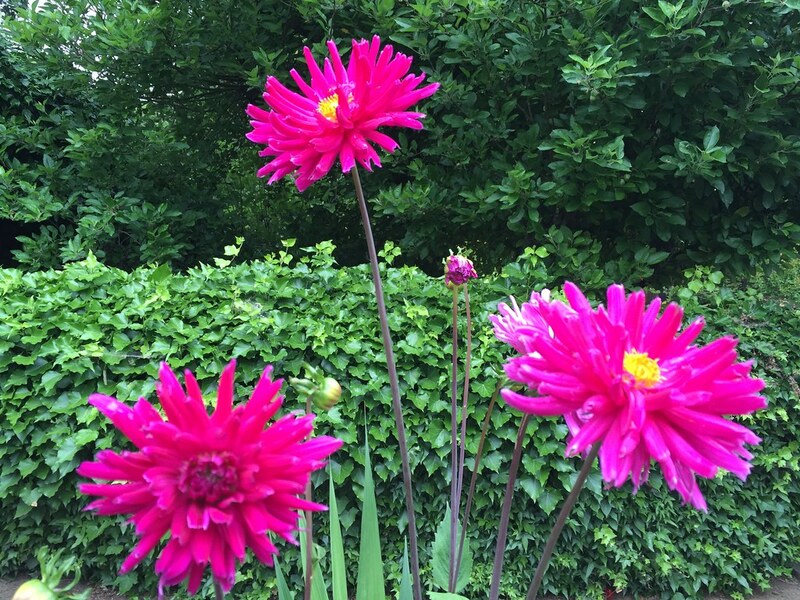 Which are my favorite summer flower and I have successfully grown them but perhaps our climate/soil/precipitation is not exactly right for them so it is a bit hit or miss. But I keep trying and sometimes get a good result.